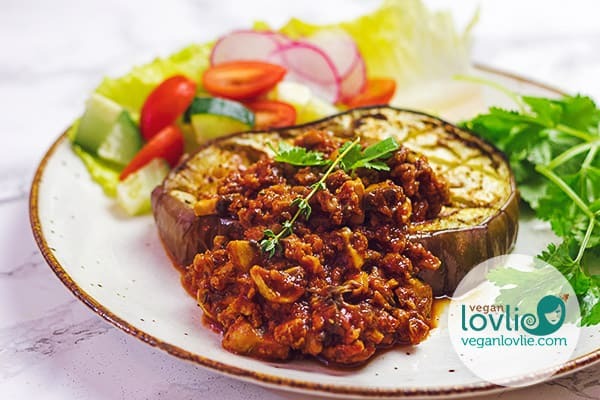 Delectable Roasted Eggplant Steaks slathered with a flavoursome veggie meatless mince sauce – a tasty simple dinner that is low in carb and vegan keto-friendly. A couple of weeks ago, we went for a casual sight-seeing trip to the Marché Jean Talon. It’s a picturesque market in the heart of Montreal with lots of fresh produce and other local food stuffs like exquisite maple butters and syrups. 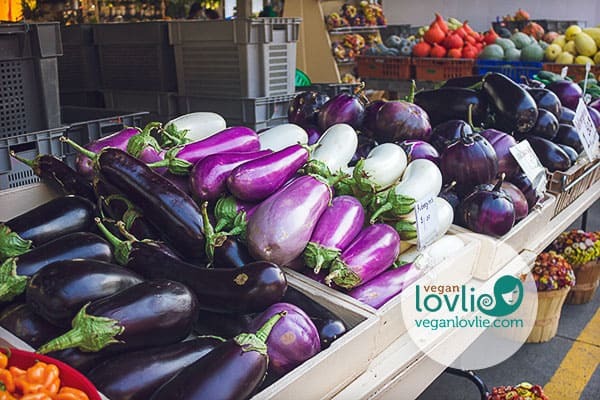 We found the most gorgeous aubergines or eggplants that we’ve ever seen there. We weren’t planning to buy a lot of produce on that day, we were mostly exploring and didn’t want to encumber ourselves with heavy produce bags to carry around. But the aubergines looked so alluring, we had to pick a few. They were only $1 – 2 each depending on the size; this was a great deal and we got three! There were quite a selection of different varieties that I don’t usually see at our local grocery store. We picked a ‘Barbabella‘ – the large round one with a unique squat shape and a distinct white halo under its calyx, a ‘Snowy‘ – the white/ivory one and a ‘Dancer‘ variety- the deep pink almost cylindrical one. All of these three varieties are sweeter than the regular globe eggplants and without any bitterness. So, salting isn’t necessary, the lady at the market told us. She recommended that we try the Barbarella as roasted aubergine steaks with a little drizzle of olive oil and lightly seasoned with some herbs. 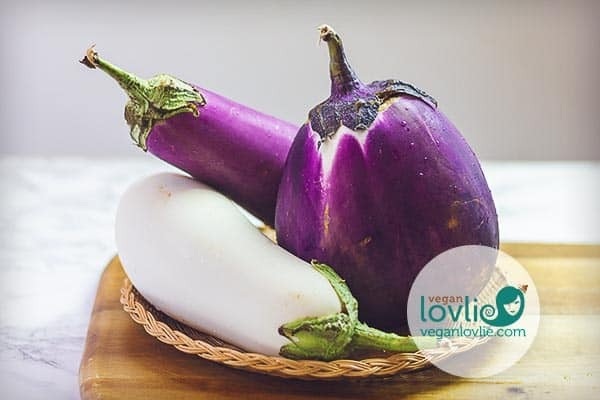 The Barbarella eggplant has such a creamy silky texture and is slightly sweet with no bitter flavours at all – really delicate and moreish! I made a veggie meat sauce to slather the gorgeous eggplant steaks with. And it was one of the best tasty simple dinners we had that week! If you happen to come across some Barbarella eggplants, just grab some and try them – you won’t be disappointed! 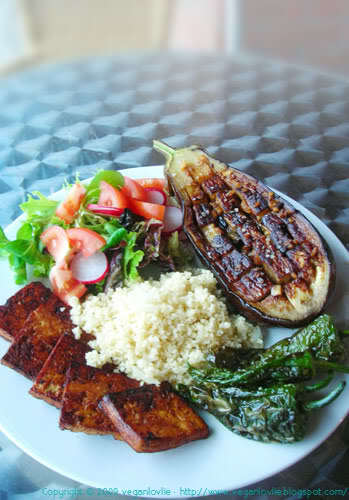 Of course, other varieties of aubergines will also make delicious roasted steaks. 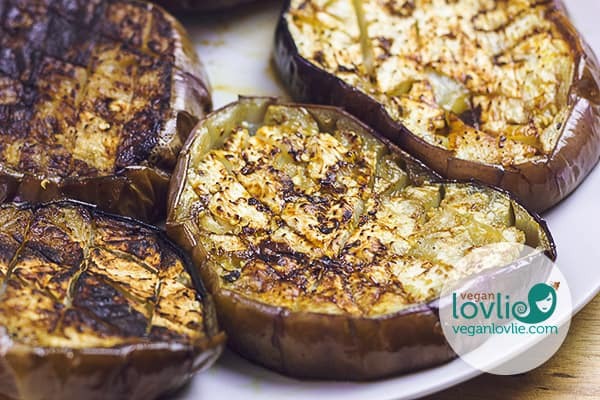 If the aubergines are not that big, you may just cut them in half lengthwise and roast them with the inside facing down to keep the steam and moisture in while baking. For the veggie meat sauce, I used store-bought veggie mince and added some mushrooms for more bulk and flavour. 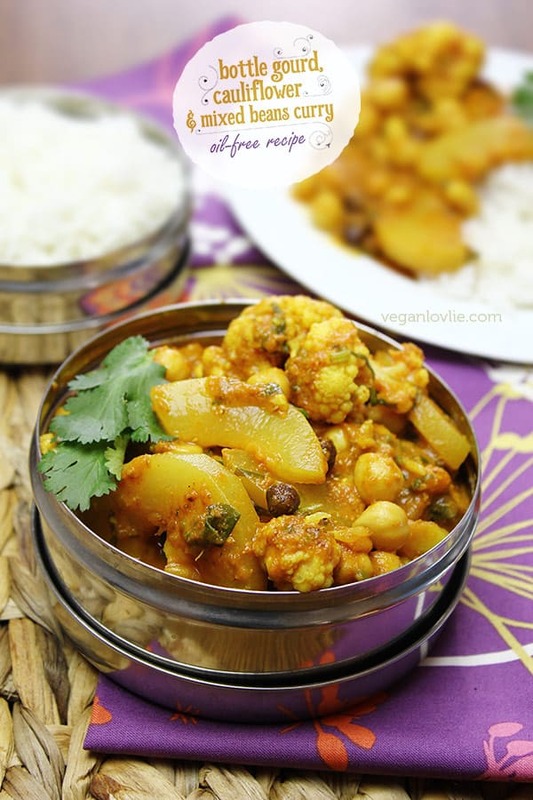 You could also use cooked green or brown lentils instead of the veggie mince as a soy-free option. I sometimes tend to make a double batch of this veggie meat sauce as leftovers reheat really well. 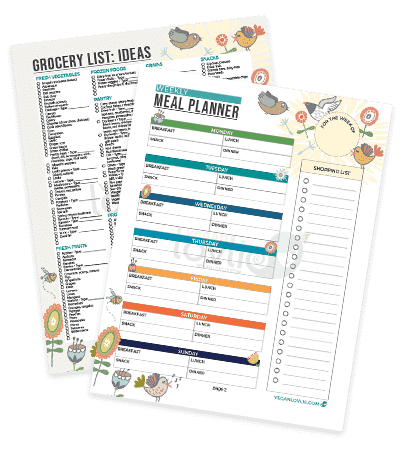 So, we can have it again the next day over pasta or rice even. We both grew up on meat sauce over rice more often than atop pasta! If I am not using leftovers for a second meal, they usually go in these vegetable pasties that I like to keep in the freezer for quick snacks. For days where we want something lighter and low in carb, roasted vegetables topped with this flavoursome sauce and a side salad work just perfectly. Slicing the eggplant into steaks allows them to roast a little faster than when they are cut into halves lengthwise. The roasting time will vary depending on the variety and size of the eggplant. The Barbarella steaks took about 35 minutes. 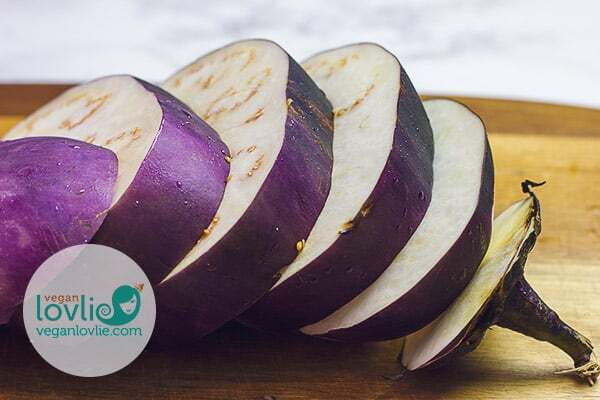 If you are using globe eggplant cut into halves, they may take up to one hour to roast. The oven is doing all the work though, and during that time you can make the veggie meat sauce. In fact, the sauce itself is made in about 20 minutes including prepping time. So, this dish makes quite an easy weekday meal that is also really satisfying. Start by preheating the oven at 200C / 400F. Slice the eggplant across into thick slices of about 2 cm (3/4 inch). If using the regular globe eggplant, slice them lengthwise. Then score a crosshatch pattern into the flesh. Take care not to cut all the way through the flesh. Place the eggplant slices on a baking tray lined with parchment paper or greased to keep the eggplant from sticking to the pan. This will also make cleaning up easier afterward. Brush the with some olive oil. Flip the slices and brush the other side. Place in the oven and bake for 35 – 60 minutes (depending on the eggplant variety and how you’ve cut them) until the flesh is tender. To test for doneness, insert a fork into the flesh. It should slide it smoothly without any spongy resistance. While the eggplant is roasting, make the veggie meat sauce. Heat 1 tablespoon of coconut or olive oil in a skillet or saucepan on medium high heat. Then, add the onions and garlic (if using) and the minced ginger*. Saute for about 1 minute and then add the veggie mince meat. Now add in the cumin, paprika and coriander powder. Stir to combine and saute for about 5 minutes. When the veggie mince starts to dry up or sticks to the pan, add the soy sauce. Then, add the mushrooms and saute for a couple more minutes. At this stage you can add the crushed tomatoes, the vegetable bouillon powder, the fresh thyme and a little water if you need more sauce. Stir to combine, cover and bring to a simmer. Lower the heat and simmer for 12 – 15 minutes while stirring occasionally. Turn off the heat and add the coriander leaves. Stir and taste, adjust the salt if necessary before serving. 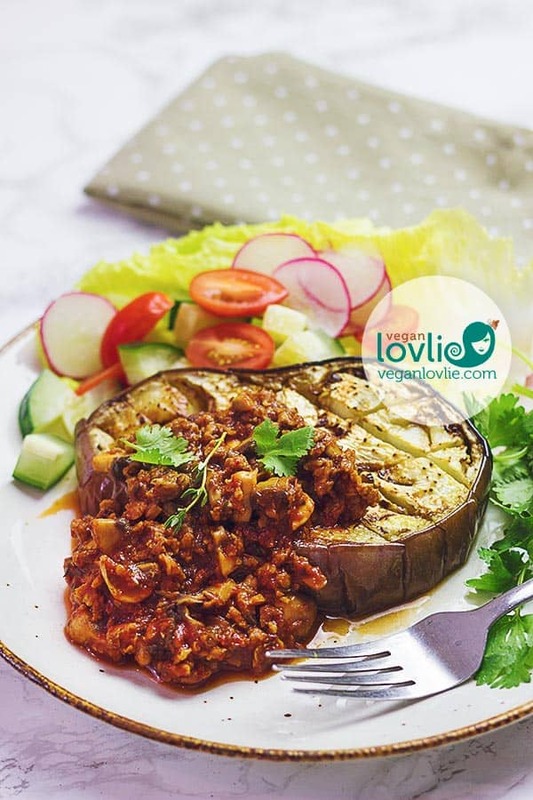 To serve, top each eggplant steak with a generous ladle of the veggie meat sauce. Garnish with some extra coriander leaves and drizzle with some extra olive oil if desired. Sprinkle with pepper to taste. Enjoy immediately! 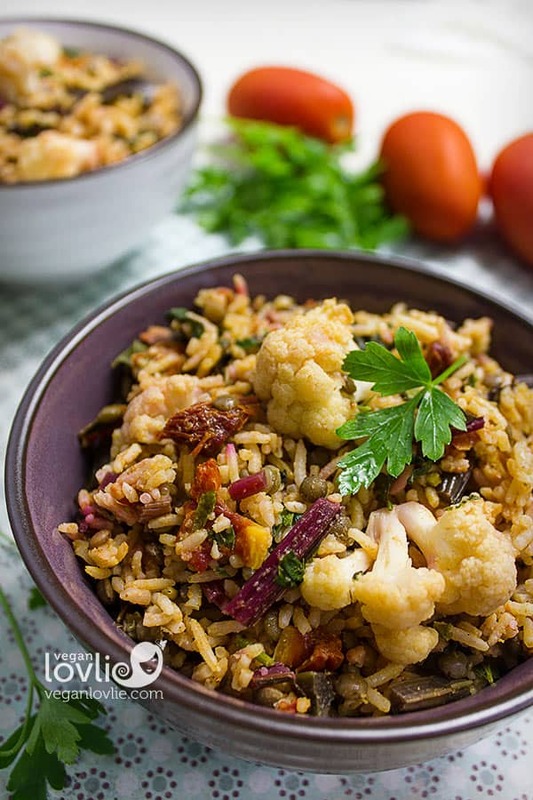 Leftover roasted eggplant can be cut into smaller pieces and added in this delicious Rice Salad with Aubergine and Lentils. *Make you own Ginger or Garlic paste. Recipes (description and instructions) are copyright © Teenuja Dahari – Veganlovlie.com and may not be republished/reprinted on other websites or elsewhere without expressed written permission from the author. 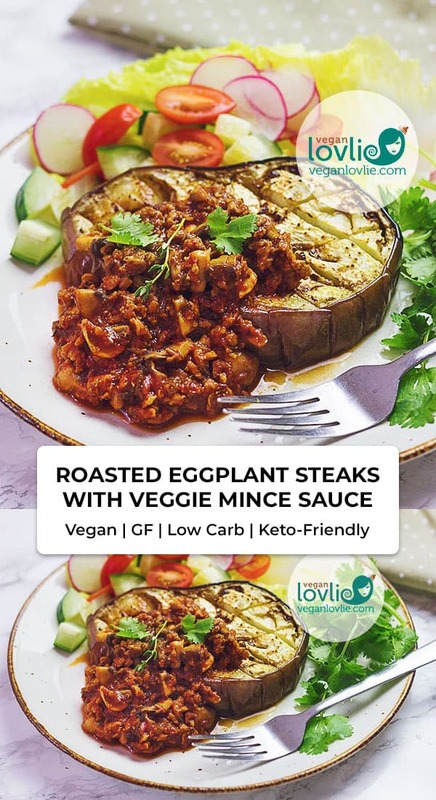 Delectable Roasted Eggplant Steaks slathered with a flavoursome veggie meatless mince sauce - a tasty simple dinner that is low in carb and vegan keto-friendly. Preheat the oven at 200C / 400F. Place the eggplant slices on a baking tray lined with parchment paper or greased to keep the eggplant from sticking to the pan. Place in the oven and bake for 35 - 60 minutes (depending on the eggplant variety) until the flesh is tender. To test for doneness, insert a fork into the flesh. It should slide it smoothly without any spongy resistance. Heat 1 tablespoon of coconut or olive oil in a skillet or saucepan on medium high heat. Add the onions and garlic (if using) and the minced ginger. Saute for about 1 minute then add the veggie mince meat. Add the cumin, paprika and coriander powder. Stir to combine and saute for about 5 minutes. When the veggie mince starts to dry up or sticks to the pan, add the soy sauce. Then, add the mushrooms and saute for a couple more minutes. Add crushed tomatoes, vegetable bouillon powder and the fresh thyme. Add a little water if you need more sauce. Stir to combine, cover and bring to a simmer. Lower the heat and simmer for 12 - 15 minutes while stirring occasionally. Slicing the eggplant into steaks allows them to roast a little faster than when they are cut into halves lengthwise. 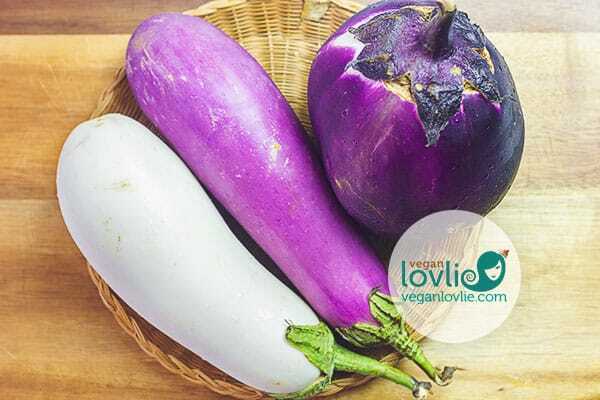 The roasting time will vary depending on the variety and size of the eggplant. The Barbarella steaks took about 35 minutes. If you are using globe eggplant cut into halves, they may take up to one hour to roast. The oven is doing all the work though, and during that time you can make the veggie meat sauce. In fact, the sauce itself is made in about 20 minutes including prepping time. So, this dish makes quite an easy weekday meal that is also really satisfying. The veggie mince sauce can be kept frozen and reheated for later use. This looks delicious! 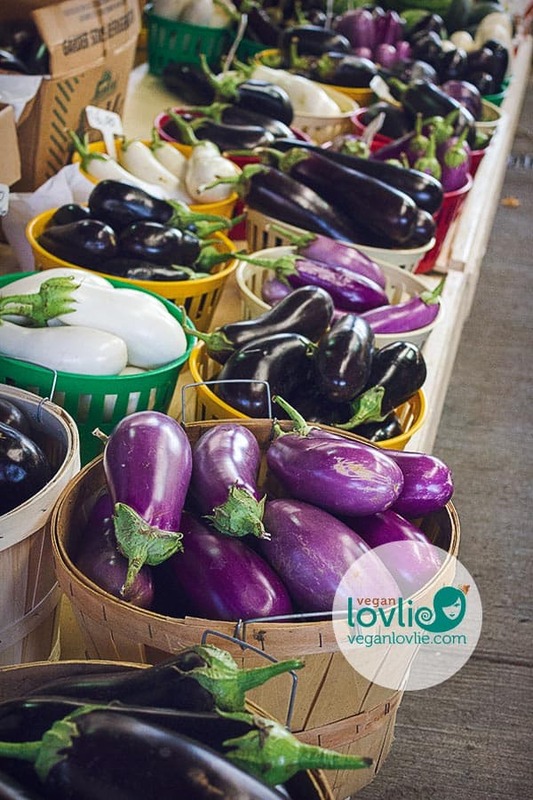 I did not know there were so many varieties of eggplant and that some do not need salting. Now I must go to the market and see what is there! Thank you for this – I love eggplant! Yes, there are so many different varieties of eggplant but unfortunately at the grocery store, we can only find the generic globe one. We get a few other varieties like the Chinese or Japanese varieties at the Asian store and sometimes at the Indian store, I can find the little round ones. It’s definitely worth trying other varieties. We were amazed with the difference in taste and texture with these ones from the market. Sieht super lecker aus und so hat es bestimmt auch geschmeckt! What is veggie mince meat? It’s a meatless alternative to ground beef, usually made from TVP (Textured Vegetable [Soy] Protein). You can use rehydrated TVP if you can’t find ready-made vegetable mince in the grocery store, but you’ll need to season it a little but more.